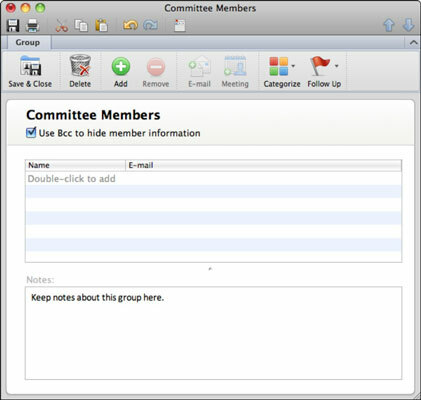 You can easily create groups of contacts in Outlook 2011 for Mac. If you create a group, you can send a message to the entire group by entering the name of the group when addressing an e-mail or invitation, instead of having to add people to an address block individually. Open Outlook Contacts and click the Contact Group button on the Home tab of the Ribbon. Type a name for your group in the group name field. The default text is Untitled Group, which is displayed in edit mode ready for you to change by typing as long as you don’t click away from the input field after Step 1. As with most other fields in Outlook, you can click the group’s name field to change it at any time. (Optional) Select the Use Bcc to Hide Member Information check box. It’s good etiquette to hide member information so that when you send messages to the group, private e-mail addresses are not displayed to everyone in the group, and so that private addresses can’t be forwarded to non-group members. Double-click and type names and e-mail addresses in the member list. Drag contacts from Outlook contact lists, folders, and search results into the message list. Click the green Add button on the Group tab of the Ribbon. When you’re done adding contacts to your new group, click the Save & Close button on the Groups tab.